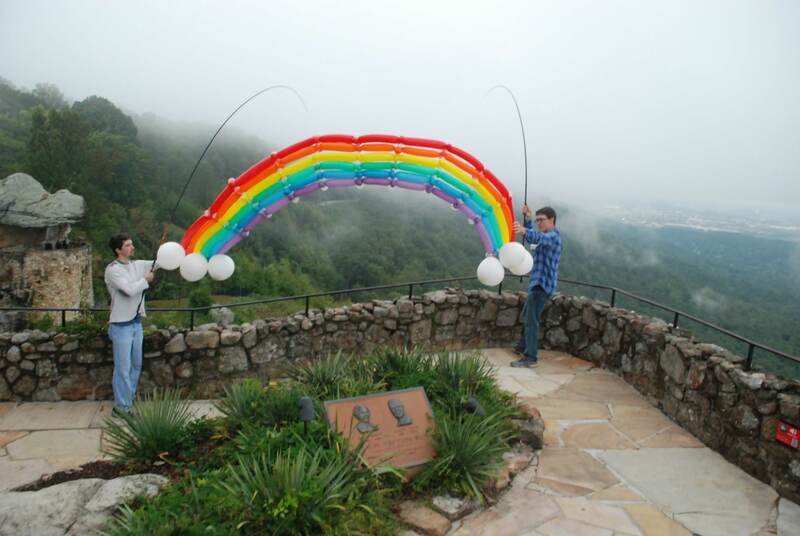 Rainbow Part 3: The Full Bow – Welcome to InflatedStory.com! Regardless of the smaller rainbows, I felt like a special shot was needed for the last page of the book. It needed a full, arching, rainbow! With that in mind, I grabbed several guys from our church college group and headed toward Lookout Mountain in Chattanooga. The weather was iffy when we hit the road, but travel weekends are hard to come by and travel companions are rare. Everyone had a great attitude as we found our KOA cabin and I set to sculpting. 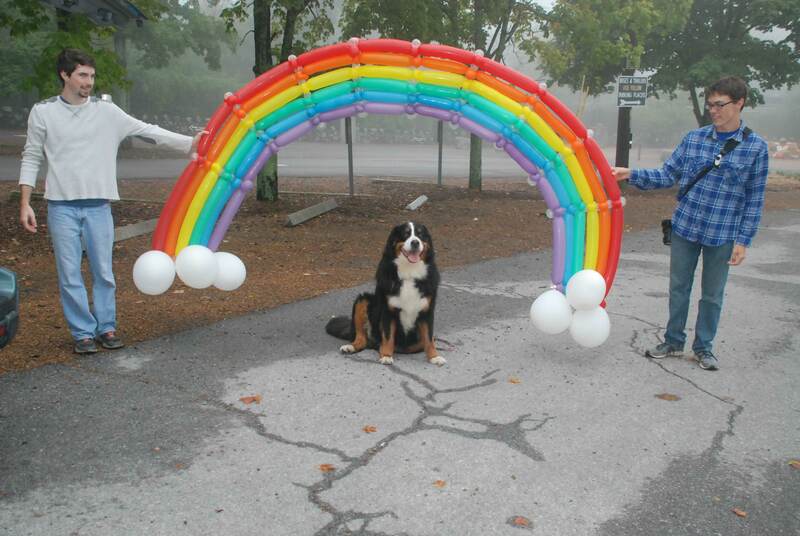 It took several hours to make the entire rainbow, which we had to fold over to fit in the back of my SUV. You will eventually get to see the balloonumentary of the process since I wore an action camera while sculpting and photographing this final rainbow. When we woke up Saturday morning, it was NASTY outside. I suppose the weather would not have felt so terrible if I had not needed to photograph balloons. I did though! We all stayed positive, but it looked like our six hour drive might be wasted. To stall for better weather, we drove halfway up the mountain and visited underground Ruby Falls. It wasn’t raining down there, but it sure was when we got back to the surface. Arriving at the Rock City on the top of lookout mountain, we were saddened to find it was even more icky than it had been when we left the falls. We stalled for an hour at Starbucks and then, with no choice but to try, we went into the park and got the best photos we could. It wasn’t raining, but it was windy and the view was a foggy mess. The trip was wasted. Correction, the trip seemed wasted. We got a nice picture of a dog in the rainbow on our way out, which I feared might be the best shot we had to show for the adventure. 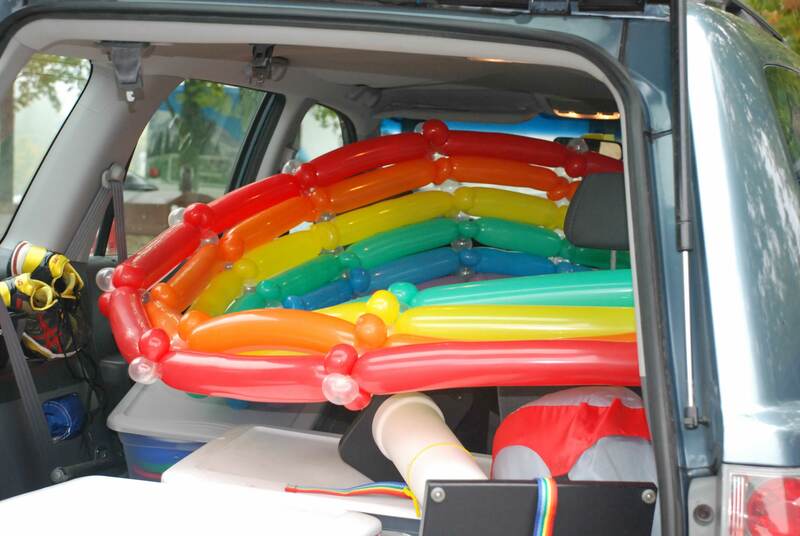 We kept the giant rainbow, and I was determined to drive back with the giant sculpture crammed in the back of my car—looking for good photo opportunities along the way. The first few hours of our travel were no better than Friday, but I kept watching for a nice view and a clear sky with a hopeless optimism. I considered the lighthouse in Pensacola and wondered if it would be worthwhile to carry an awkward balloon sculpture around seemingly countless winding stairs to get a photo from one of the few high points in Pensacola. Gratefully, Alabama offered me a better opportunity. Did you know Alabama has some beautiful parks? When we passed Oak Mountain State Park, we decided to give it a try. The kind woman at the gate suggested where we might find a good vista in the park and we headed up to the summit. Sure enough, we found a beautiful view! The picture is not quite what I had dreamed of in Chattanooga, but that is part of the adventure of The Inflated Story of Noah. These are not the same sculptures someone might be able to make in a perfectly climate controlled room and with a green screen. These sculptures represent adventures around the globe!